Clear Cragslane Cavern for the Jarl of Riften. Read the note you were required to find to finish the previous quest. Report to the Jarl of Riften. Visit and clear the Cragslane Cavern. Return to the Jarl of Riften. After you have read the letter you will need to return to the jarl. When you tell her that you have discovered the location of the skooma traders, she will ask that they "be destroyed once and for all", and entice you with the prospect of a title in Riften. This prompts an update of the quest to find the cave. The cave is north of Riften, and northeast of Shor's Stone. There is a single bandit and two pit wolves outside the cave. The wolves should be inside the two expert-locked cages, but are usually found roaming the small camp. Enter the cave to find a bandit standing guard near a lit lantern; after you ignore the warnings, or get too close, you will be attacked. Further down the tunnel and around the corner is the main gathering room of the suppliers. There are three gamblers, a barkeep, and a pit wolf in the first part, and a bandit, and two pit wolves locked in cages, in the second part. Loot the barkeep for the Craglane chest key, and the second bandit for the Craglane dog cage key. Go behind the bar in the northwestern corner to find a leveled apprentice-locked chest, a bowl of moon sugar, two bottles of skooma, and a copy of the Lockpicking skill book The Wolf Queen, v1. 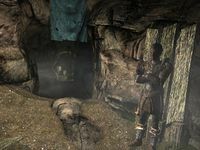 The second part of the cave contains another leveled apprentice-locked chest with a bear trap in front of it, the two apprentice-locked wolf cages, and spread over the preparation area, a few ingredients, a bowl of moon sugar and seven bottles of skooma. There is also a set of miner's clothes, which are rare to find lying loose. After two quests involving two fights, one of which descends into a large brawl, you have well earned a reward. Return to the jarl and she will reward you with a random enchanted weapon, and express her gratefulness, "Your continued efforts have been of great benefit to the people of Riften." 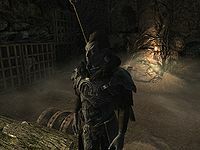 Additionally, if Maven Black-Briar is jarl, then following the eradication of the bandits in Cragslane Cavern, she will send her people to gather any remaining merchandise because "We can't have that substance falling into the wrong hands now, can we?" She will also reward you with some gold, stating that "this should suffice as your cut of the... or rather, a reward for your actions." Every person in the cave must die for the quest to progress. All the wolves, however, can be spared. The rewarded weapon's enchantment and type are both random. This is the third of three quests that are required to unlock the option to become Thane of Riften for the Jarl of Riften. There are additional requirements noted on that quest's page. If Cragslane Cavern has been cleared before receiving the quest, you will need to go to more trouble to complete it. When this occurs, you need to clear the cavern three times in order for the quest to complete. You need to kill a total of seven bandits to "disrupt the operation", but only the three bandits respawn after you have cleared it. Travel far away and wait thirty days for the cavern to reset. Return and kill the bandits three times to get a total of seven. You can use the console command player.setstage FreeformRiften01 40 to advance to the next quest stage. An alternative workaround is to repeatedly resurrect one of the dead bandits via console until you have a total of seven dead NPCs. If you exit the cave during the fight and reenter, the quest may not advance. ? On the PC, it is possible to use the console to advance through the quest by entering setstage FreeformRiften01 stage, where stage is the number of the stage you wish to complete. It is not possible to un-complete (i.e. go back) quest stages, but it is possible to clear all stages of the quest using resetquest FreeformRiften01. Esta página foi modificada pela última vez à(s) 17h25min de 17 de janeiro de 2015.